See link to one such ‘over engineered’ reference here, click here. The design of this overflow was driven by a need to reduce erosion of the small stream to which it discharges to. But its design also allows it to be ‘turned on and off’, by the use of sluice valves. So it is a relatively ‘intelligent’ canal overflow, when compared with the common ‘dumb’ types. These are usually simply low walls with streams running behind to catch the spill over water. Grand Canal overflow, Sallins. Click to enlarge. 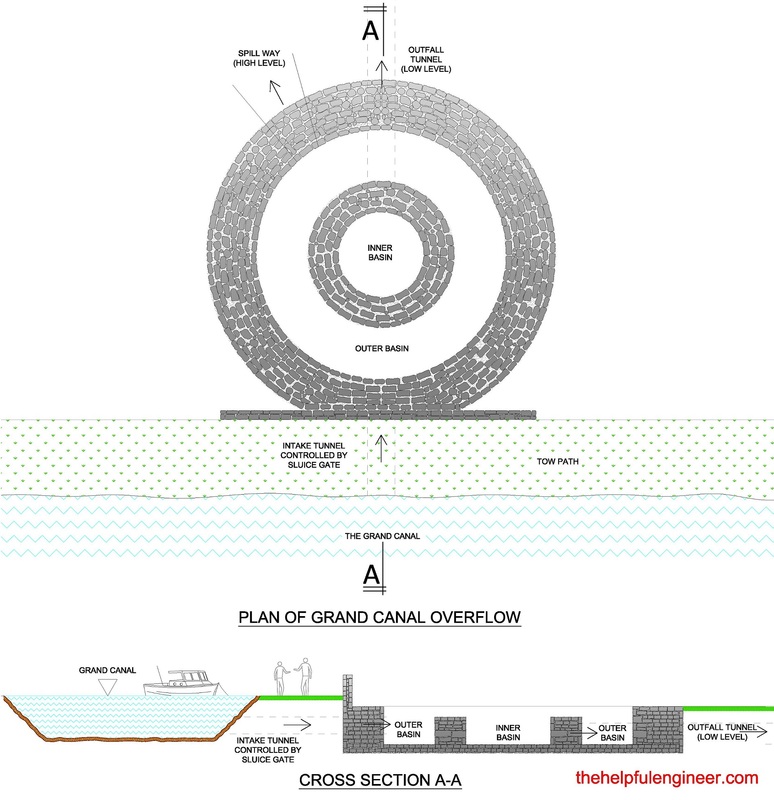 How it works: Looking at the sketch, it can be seen that water enters the overflow on the left, shown in section A-A, through a tunnel from the canal. The flow is regulated by a sluice valve. The water fills the outer basin until it is full and then pours over the lower wall into the inner basin. 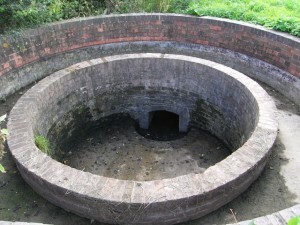 The water flows from the inner basin though a tunnel to the stream at the rear. For added protection there is a high level spillway to deal with any blockage to the inner basin outflow tunnel. Presumably there is a second drainage tunnel to empty the outer basin for maintenance etc, but I could not locate it. This then is the design that has been referred to as being over engineered. But I am not so sure. The reason for the double basin arrangement is clear as it is to remove power from the incoming water thus preventing damage to the stream behind. However I think it has the further advantage that once the outer basin is full, the water pressure difference between the canal and outer basin is significantly reduced. This then takes pressure off the sluice valve and makes it easier to operate, but more importantly easier to close. While it may be the only example of its type in Ireland, there are canal overflows in England which are similar in design, although much smaller, see photograph of two below. It is worth noting how well maintained the English overflows are compared with their Irish counterpart. 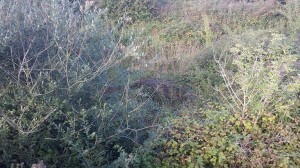 So while there is doubt as to whether the overflow is over-engineered, it is certainly overgrown. If it was cleared out and exposed properly, people could see it clearly, admire it and maybe even debate its merits…..
Update. Why was the overflow located here? See comments section below for a discussion of the potential reasons for the overflow at this particular location. Knowing this structure well and having often pondered it’s workings, I was pleased to be sent a link to the article. It certainly makes sense mechanically – thanks for that. What really fascinates me is its location and I’d be very interested if anybody has any suggestions as to why the overflow was built where it is. For, given a simple spillway at the Liffey aqueduct would have cost a fraction of the outlay and controlled the level just as adequately, I’m at a loss to understand its location. You make a good point about its location. While the stream it discharges to ends up in the Liffey, its strange that an overflow wasn’t incorporated into the aqueducts design. I can’t think of an obvious reason why the overflow was located where it is. But looking at the Ordinance Survey maps for the area there was once a large quarry a short distance to the North of the overflow (and many more to the south). Perhaps the water from the overflow had some use in the quarrying process? Interestingly there was once a short section of railway linking the canal at the overflow to a quarry behind, along with an engine house at the quarry itself. While the overflow pre-dates the railway, it does seem to have been a bustling spot at one stage, especially when compared to now. There is a very interesting view of the overflow on the OSI Historic 25″ map http://maps.osi.ie/publicviewer/#V1,686878,723910,7,9 (other views are less detailed). I’m unable to interpret all the bits and pieces, but does it convey anything to the expert eye? I’m looking at books and searching for sources, but with little to report so far. Those 25″ maps are wonderful. I played around with the historic layers and they even show up the sluice gate on the overflow. Anyway to try and answer your question about why its positioned there; and dismissing my theory about the quarries for a minute. Looking at the 25″ maps between the overflow and the Liffey, it is noticeable that the north canal bank becomes much steeper as the canal approaches the Liffey. This is in anticipation of the canal being carried high over the Liffey. So perhaps the overflow is positioned where the drop between the canal and the surrounding land is the least. In fact looking at the whole canal level between the 15th lock (Morrell feeder) and 16th lock (Digby Bridge). In this whole stretch of canal the only other place where there is a combination of the canal close to the surrounding land level, and being close to a stream, (that doesn’t discharge back into the canal later), is here at the overflow location. The overflow at the 15th lock doesn’t count because this actually discharges back into the canal between the 13th and 14th locks, and there is a relatively large height difference to the surrounding land as the canal is carried over the Morrell Stream on a small aqueduct. As the overflow was designed to minimise the power of the discharging water, locating it where the drop was least was a handy way to reduce additional work in the overflow design/ construction. But if this theory is the reason, the question remains why is the overflow not used, surely it is still needed to regulate the water level with numerous streams discharging into the canal. There is no obvious answer to this other then to wonder does the ‘relatively new’ pumping station at the Leinster Aqueduct also incorporate an overflow device. If it does once built, this would have left the old overflow redundant and thus it was left abandoned to become overgrown? I’ve no expert eye but know the landscape there and on looking at the 25″ map (thanks BJG) I initially favoured the explanation that the water was probably used in the quarrying process, possibly even channeled to the quarry under, or adjacent to, the tramway. But I can’t see any drains marked from the quarry: if I’m reading the map correctly my understanding is that the only drain from the overflow (which I’ve always heard called ‘The Four Pots)’is down the side of the canal with cuts cuts running off it. Could the arrows beside some of these cuts be indicating the direction of flow? I’m told a lot of flax was once grown in Kildare, and the processing, or ‘retting’, of flax involves a lot of water: retting with running water gives a more valuable product than using still. Could this be an explanation? Or could the irrigated area just be very posh paddocks? That sort of wealth might explain the fancy dan overflow. Apologies – you posted while I was writing my own comment. Does the landscape also make that site the ideal for irrigation? Following those arrows it would appear the water was run into the Liffey. I believe the pumps at the aqueduct are two directional – there’s certainly lots of water running out of that pump house when the canal level needs dropping. That’s interesting I hadn’t considered irrigation, the stream seems to join the Liffey near Millicent Bridge, which is a reasonable distance away and so a large number of fields would benefit from access to a good water supply. In August 1773 the Grand Canal Company (actually the Company of Undertakers of the Grand Canal) asked the engineer John Smeaton for his advice on several points. 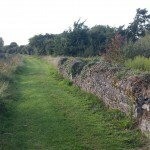 The canal at the time had not reached Sallins [it was opened to Sallins in 1779], although some work seems to have been going on further on; part of the discussion was about whether the Company should join the canal to the Barrow first or to the Shannon. Smeaton assumed that the Morrell Feeder would enter the canal near Sallins bridge, rather than two locks further on as it actually does, so the overflow would have been at the western end of the level at which the Morrell entered. 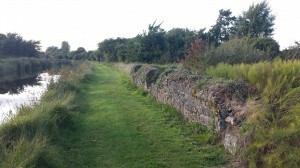 The Company also asked (inter alia) about how the Liffey should be crossed; Smeaton recommended an aqueduct. This http://books.google.ie/books?id=gEUOAAAAYAAJ&dq=%22grand%20canal%22%20sallins&pg=PA31#v=onepage&q=%22grand%20canal%22%20sallins&f=false should be a link to a Google book of Smeaton’s reports; the Grand Canal material starts on page 12. Note that Smeaton had two sets of answers; the bit I quoted is from page 28. This suggests a possible reason for having an overflow just below Digby Bridge/Lock 16 but I am unable to assess either Smeaton’s report or the facts on the ground to judge whether this is a reasonable explanation. That’s very interesting. So at the time Smeaton seemed to distrust the water quality from further West. Perhaps they thought water from a fen or bog would be unsuitable for consumption even after filtering? The only question it raises though is that this question was put to Smeaton years before the canal reached the overflow. When the work commenced on the overflow the Canal Company should have realised that the P. fen water was as clean, if not cleaner, than the Morrell feeder and would have been no issue with mixing of water. His focus seemed to be on the Blackwood Feeder supply, though, which might not have been to the same standard. I’d have to re-read the stuff to be sure, though; I may have time later. The more I think about this theory the more it seems plausible. Every reference to the Pollardstown fen feed water mentions how crystal clear the water is. While there is silence regarding the Blackwater Feeder. And perhaps the name ‘Blackwater’ is a give-away anyway! There is form in this. The lovely Bohernabreena Reservoirs in South County Dublin, were built later in the 1880’s, to supply drinking water to Dublin. The canal water had became inadequate for the growing city. The water flowing down the hills on the Western side of the upper reservoir is peaty water. As a result it is diverted away to prevent mixing, using a complex arrangement of interception streams and weirs, (the upper reservoir is used for drinking water supply only). Perhaps the Blackwater feeder supply was generally suitable,why else connect to it. But perhaps after heavy rainfall, it became particular laden with peat, and it was necessary to divert it away from the canal. Before it mixed with the Morrell feed water? Obliviously the overflow still had the additional benefit of controlling the water levels. 1. It was positioned where is was as it reduced construction costs, the combination of the height difference and stream location were the best available for this stretch of canal. 2. The position also had the advantage that it could be used to divert peaty Blackwater feeder water away from the Canal water (and into the Liffey), prior to the addition of the Morrell feeder water downstream at the 14/15 locks. 3. And a secondary benefit was that the local small streams water level could be boosted in case of irrigation requirements. What’s puzzling is that the lock (16) above the overflow is the only one on the Grand Canal where side ponds – a water conservation mechanism – were constructed. Which suggests there were concerns about supply. The Sallins stretch though does have an abundance of water – the Corbally Line and the feeder stream just east of Sallins itself – so might the water being run through the overflow mechanism have been sourced from the east rather than the west? True. I would love to see the lock 16 side ponds working again. But the Sallins canal stretch isn’t always that water abundant. For instance despite the few streams flowing into it, (and the Naas and upper Grand Canal emptying into it), the Liffey pumps seemed to be in operation every time I passed this year. I passed the outflow in the water as well, while canoeing, and there is quite a fast flow coming out. I don’t know if they have enough force to cause an effect on a barge moving past though? And the pumps do put a barge a little sideways – as long as the bow gets into the aqueduct and you’re not overly precious about paint, it’s pretty hard to miss though. You may be aware that back pumps have been installed at locks 16/17/18 so the Liffey supply can be pumped to the summit should the Milltown feeder prove inadequate in future dry spells. True, its hard to really know for sure how things were set up then. I noticed the pumps at Digby Bridge, but not further along. I will look out for them next time I am around the areas. The pumps at Digby Bridge, when operating, always seem a lot quieter than the Liffey ones, perhaps its because the water is being lifted by less of a height. I think your piloting skills are much better than mine! I have only driven rental (plastic) boats and found it quite difficult to get into locks without bumping the walls, and that’s without pumps at my side! But the 16th and 17th are upstream of the Morrell; I do not understand how reducing the amount of water flowing down to the 14th and 15th levels could help to improve supply to those levels. OTOH, side chambers might reduce the amount of “bad” water polluting the “good” Morrell water lower down. I’ve re-read Smeaton’s reports, and the Grand Canal Company’s questions to him, and neither side seems to envisage using the Milltown Feeder, although Ruth Delany suggests that it was (by 1790) seen as more important than the Blackwood. It also seems, though, that Smeaton was considering a route to join with the Barrow entirely different from that eventually adopted. But I don’t want to nail my colours too firmly to the water-quality mast: I don’t know enough. I see from Smeaton’s report that he envisaged taking a supply from the Liffey at “new bridge” via Roseberry, the “bridge of Canah” [Carragh?] and the “mill of Cabbertealy” [which I can’t find on the 6″ OSI] to “Langonstown” [Landenstown, presumably above Lock 18]. If the section west of the Liffey was (to some extent) in water, for work-boats, before the aqueduct was completed, is it possible that side-chambers and overflow were intended to reduce the amount of water that could flow towards the Liffey and interfere with the works there? A very interesting extract, thanks. But the mystery deepens! You introduce another angle on the overflow, i.e. that it was built to divert water away from the aqueduct (when they were building it). 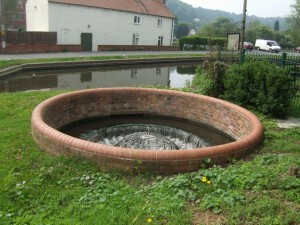 To take this point further, was the overflow also useful for allowing maintenance work on the aqueduct. If the canal was to be drained to allow repair work on the the aqueduct and underpasses beyond, the overflow could divert the feed water away from the works. I read once that pigs blood was one of the constituent materials for the water proofing of canal aqueducts, perhaps the builders envisaged draining would be necessary to repair/ maintain the waterproofing and structure? i would assume that what he was talking about here was the feeder that flows into the canal about a quarter of a mile east of sallins and if memory serves is a tributary of the morrell.the one that caused all the trouble during the floods a couple of years ago.it is hard to trace on the osi maps but goes very close to the morrell near johnstown. My understanding is there have been pumps here for a long time but they were inadequate. They they have been upgraded in recent years. I only noticed the water being pumped up to the summit for the first time, last May. I’ve been chatting with a farming/boating friend and he’s suggesting that cress may have been the reason behind the irrigation scheme (that’s if it is an ‘irrigation scheme…) as it was once a valuable crop here. We really could do with an agricultural historian pitching in. 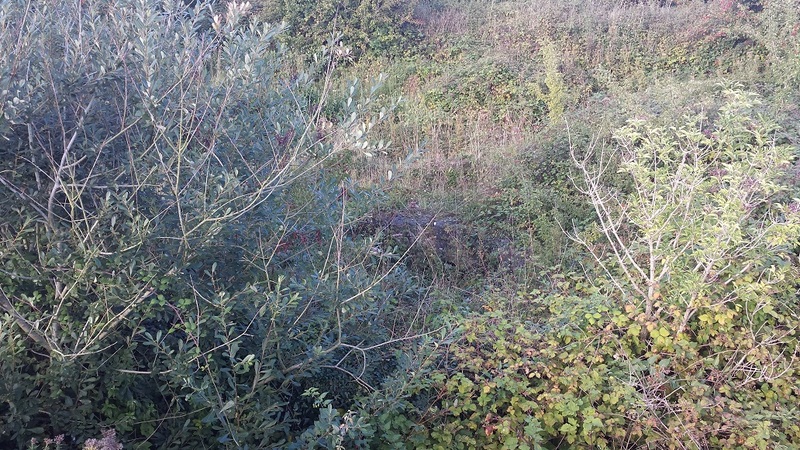 Does anyone have knowledge of cress or flax growing in this area in the past? there were sideponds at the 16th,17th & 20th locks.the 17th was only filled in a couple of years ago. i can not say whether it is true or not but the story i heard about the pumps [16,17,18]was that the ESB agreed to install them when the old power station in allenwood was built because they needed cooling water for the station and it was to be taken from the canal. ETA..sorry my second post above was confusing.it was in reply to bjg’s post…….